The 2010 Oakcliff Invitational Clinegatta had three very good days of warm winds surrounding two not so good days. The field was very competitive and the tricky and varied wind conditions were a true test of all-round sailing ability with a dash of patience and endurance thrown in. In the end the young New Zealand Team skippered by William Tiller came out victorious in the 2-0 finals against top US Sailor and clinic leader Dave Perry. The first race of the finals saw many flags and an overlapped finish. The second and final race was started just before the regatta time limit expired and was somewhat less dramatic. Coming in third was Jon Singsen sailing with cadets from the USMMA at Kings Point who bested Olli-Pekka Lumijärvi of Finland. The other four in order, Klaartje Zuiderbaan sailing with her sister and two extraordinary female sailors, Natalia and Lee Icyda of the US. Klaartje’s team was supplemented by Oakcliff acorn Colin Leon and then Eric Barreveld who coincidentally is fluent in Dutch. Oakcliff Supporter Mike Qualio and a mostly family team came in 6th, followed by Kevin Dooley and Doug Shannon. One thing to take notice of was that 5 of the 8 teams had women and 7 teams had Oakcliff Team Members on board. The winning team featured Oakcliffers Ronnie Saccardo on the bow and Mike Tolsma in the pit. Mike is an up and comer who is an accomplished rock and mountain climber and since May has set his sights on sailing. He began with Oakcliff on the Ker 50 where his answer to virtually any questions was, no I’ve never done “X” but I’ll learn. 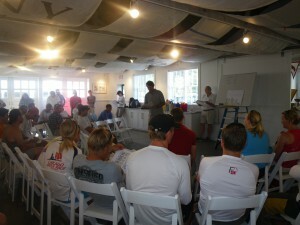 Mike epitomizes the Oakcliff mission of raising the level of sailors and sailing in the US. We are lucky to have this combination of talent and awesome attitude in Mike and many other Oakcliff team members. Finally as with all major events like this it could not be done without great staff and volunteers. 100 % of the Oakcliff staff who were on-site pulled double duty by competing, as well as assisting in the organization of the event. A special shout out to Kevin Dooley. We had hospitality extended to our out of town competitors and officials by the Storrs and Hildebrant families. Chief Umpire Bruce Cook led a team of umpires and Race Committee Todd Fields, Caroline, John Mooney, Anne Mooney, Danniel Gallo Chris Dundon, Dylan Bush, Aidan Vascatto worked tirelessly to chase the fickle winds.